Dove Cottage Young Poets are currently recruiting new members! 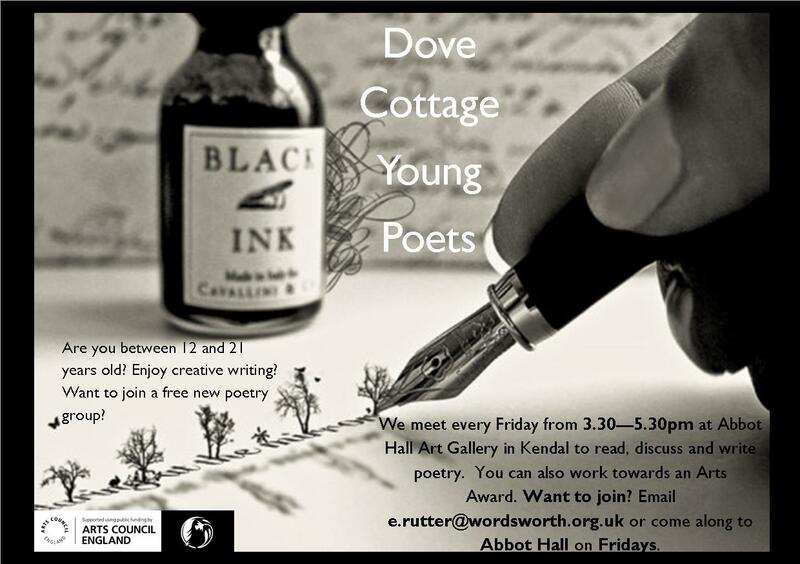 We meet on Fridays from 3.30pm-5.30pm at Abbot Hall Gallery in Kendal to read, discuss and write poetry. This year there will also be an opportunity to work towards an Arts Award. If you are aged between 12 and 21 years old and you are interested, please email Esther Rutter at The Wordsworth Trust: e.rutter@wordsworth.org.uk or me: kimmoore30@hotmail.com. The group is completely free – if you know anybody who might be interested, please feel free to share this information. Our sessions for the summer start on the 8th August. Evening folks. On Friday afternoon I was running a poetry workshop for a group of young writers as usual in Kendal. Esther Rutter has been developing a private wordpress blog for the use of the young writers in the group and she showed me a few more tricks on WordPress – some of which I’ve forgotten now, but it has left me with a desire to make my blog look a little more attractive – it wouldn’t kill me to put a few more photos on, for example! So above is a picture of a murmuration of Starlings, to go with the poem by Holly Hopkins which is this week’s Sunday Poem – more on that later. She also showed me the correct way to link to another web page without having long messy addresses all over the place – something I’ve been vaguely thinking I should learn but never quite having the time or the inclination to actually do it – so I will be trying this out later – and hoping that someone will tell me if it doesn’t work. This week has been a bit crazy – the last week of school is usually a mix of the pressure of end of term concerts and extra free time as the schools go into end-of-term madness and cancel all the music lessons. Although I had quite a few cancellations this week – some of them the minute I walked in through the front door and the teachers look at me blankly and realise they haven’t told me that the kids are having an end of term party/on a trip etc etc I also had a few last minute concerts and assemblies – overall I think I’ve worked harder than I normally do! Apart from work and end of term concerts I’ve not really been up to much else. I was gutted on Tuesday because I had to do an end of term concert which meant I couldn’t go to Grasmere to see Robert Hass and Philip Gross read. It was a strange feeling – part of me wanted to have a huge tantrum about it – this is the reading I’ve been looking forward to all year but the other part of me knew I had to just get on with it. And in the end, the concert was quite nice and I got a lovely message from a parent thanking me for helping her child to enjoy music – which is something I don’t really get thanked for very much actually – often parents will thank me for helping their child through an exam or to perform a solo – but it was nice to be thanked just for helping someone to enjoy music – it reminded me why I teach and stopped me sulking about the Robert Hass reading as well. Monday evening was the Barrow Shipyard Junior Bands end-of-term concert and although at the time I didn’t have time to feel sad or emotional – I did when I got back home and it hit me that another year was over and that I wouldn’t be conducting the band again until September, but I am looking forward to the summer holidays. I’ve got quite a few things to get done so I will need to be disciplined with my time – I’ve fallen into the old trap of putting lots of things off until the holidays, thinking I’ll have plenty of time to do them and I’ve probably got a long enough list now to fill 12 weeks not 6. This is due mid-August – an article about what Sylvia Plath means to me. I’m looking forward to writing it, but I’m still looking for my gateway into it at the minute. I’m expecting all of this to hot up in the next couple of weeks and I’ll be planning workshops and other stuff. This is due in after the summer – I really need to get this started and get some momentum with it. We’ve finally had a mortgage offer so I’m hoping all of this will start moving now. I’m surprised though, that anybody moves house. I haven’t found it particularly stressful so far, even though it’s taken eight weeks just to get a mortgage, more annoying and time consuming. Plans are afoot for a reading tour with a difference with poets Clare Shaw and Keith Hutson – we are slowly but surely putting together an itinary for a reading tour with a difference – no walking for us – we will be running from Yorkshire to Cumbria and reading on the way. We’re hoping to create some new work together that we will perform as part of this tour. I’m working on the premise that talking about something as if it is real means it becomes real and now I’ve put it on here – there is no getting out of it – we will have to do it! I’m really excited about this – but due to the craziness that will be my October – residency in Ilkley and all as well as teaching, I’ll be planning my workshops over the summer holidays so that I’m ready to go. I think the residency finishes the week before the course starts so I can’t leave anything till the last minute. And then there is all the normal stuff of course – maybe I am packing too much in to a small space of time. I have decided I’m going to have 1 hour every day where I do nothing but read poems – so that will be nice. So that’s my summer! I’m really looking forward to it- next week I have David Tait coming to stay who is visiting from China – I’ll finally get to see his first collection as I’ve been holding off buying it so I can get a signed copy from him. David will be reading at The Wordsworth Bookshop in Penrith on the 24th July with myself and Josephine Dickinson and at Ulverston Library on the 25th July with Gill Nicholson and Neil Curry as an extra Poem and a Pint event – please click here for more information – it would be lovely to see you at one or even both events if you’re really keen! So today’s Sunday Poem is by Holly Hopkins whose poetry has featured previously as a Sunday Poem. Holly was one of the four winners of the Poetry Business Pamphlet Competition and she stayed at my house with her partner Alex on the weekend of the launch of her pamphlet. Holly’s pamphlet, rather brilliantly is called ‘Soon Every House Will Have One’. This pamphlet is full of cracking poems – you can find ‘Duck’ here but other favourites are ‘Offchurch’ with it’s lovely description of a ‘saucer-faced barn owl’ and the poem ‘The King’s Manor Cat’ which always makes me laugh out loud in the last three lines ‘We must raise up the banners each morning/with the pulling back of the bedlinen./We must not eat the liver.’ Perhaps my top poem in the pamphlet though is ‘Explanation for those who don’t know love’ which is a poem which starts ‘I have a child and am more important/than childless people.’ It is all very tongue in cheek and extremely funny, probably, I admit more funny for people like me who don’t have children. The last poem in the pamphlet is called ‘Anglepoise’ and is a carefully observed study of an Anglepoise lamp that moves on to become a mediation of writing and self-worth – the pamphlet is really excellent and if you are saving your pennies for something special – treat yourself to this one. It’s only £5 and you will be supporting a lovely poet and her fantastic publisher, The Poetry Business. You can order the pamphlet here from Holly and she might even sign it if you ask nicely. I’ve chosen this poem ‘Starlings’ from Holly’s pamphlet because it is that rare thing – a poem with end-rhymes that work beautifully – they don’t feel forced on to the poem but are working with the sense and rhythm of the words. It reminds me a little of some of Don Paterson’s poems in ‘Rain’ because of the skilful way the rhymes are handled. The poem is also saying something beautiful, describing something beautiful. When I was looking for pictures of starlings in flight to put at the top of this post – I found the black clouds in the pictures quite disturbing and eerie – maybe because in the pictures it looked more like a swarm of insects than birds – but look at the last line of the second stanza and its description of the flock which ‘stretched itself like kneaded dough’ – I read that and thought yes, she’s nailed it, but then she does it again with her ‘hemmed within a living sack’. There is a sense of something being not quite right in the poem right from the first line when we read ‘We’d heard the fens were dying seas/pinned into their beds by reeds;’ – that is a haunting image and the use of ‘dying’ and ‘pinned’ introduces the idea that something is wrong in the poem. This is only ever hinted at though by language – the ‘washed-out winter marsh’, the ‘ragged lines’ of the birds, the way the flock ‘smashed itself across the dusk’. Really, the poem is about, I think, the ‘thread of trust’ which binds us together, and by us, I mean the birds and the couple in the poem, the poet and the reader. through the washed out winter marsh. were hooked into the weedy ground. upset the other’s new-found wings. Dear Mr Gove – Goodbye! Goodbye! Goodbye! Evening all. I’ve dragged myself away from editing my collection with great difficulty tonight to write this post – which is strange because I had to really force myself to start editing. I think I was worried because I knew that there were problems in the manuscript that I needed to sort out and I was panicking, thinking maybe I won’t be able to sort them out, so I didn’t want to start. I’ve sent the collection out to a few poets and I’ve had lovely feedback from them – all of them identified things they weren’t sure about – some of them they even agreed on (without knowing it). Today my good friend Noel Williams wrote to me, sending me 12 pages of detailed feedback, going through each poem and in particular focusing on the order of the poems, which is what I’d asked for help with. So armed with this and combining it with the other feedback I’ve had I’ve finally started sorting the collection out. My method for this is to re-type the whole thing again, which is risky because I could type mistakes in but it is my way of editing. I taught myself to touch type when I was about 17 – probably the most useful skill I ever learnt and I love typing. I like the shapes that words make on the keyboard when you are touch typing and for me it is an important part of editing – it forces me to slow down which is always a good thing. This afternoon I helped out the Barrow Steelworks Band at a local church service, just playing hymns whilst the congregation sang. I actually quite enjoyed it – one of the congregation read a really lovely extract from ‘the electric bible’ (what ever that is) but the first line was ‘The clouds are the prophets of god’ or something like that. I should have written it down. This morning my alarm didn’t go off and I woke up at 9.30am which left just time to shove a chocolate croissant down and then jump in the car to get down to Roose to go for a run with the Walney Wind Cheetahs. Because of my disorganisation, I wasn’t in the best of shapes, but I managed 6 miles at a respectable pace. Yesterday I had a go at beating my PB at the 5km park run which is held every Saturday. I managed to knock 11 seconds off – I went from 25mins 13 seconds to 25 minutes 4 seconds…so I’m heading the right way to get under 25. This week in general has been a funny old week. I’ve spent a lot of it driving round to schools and finding I’m not needed or wanted in because the children are on a trip/having a party/doing something more exciting. It’s still been busy though because my quintet, the South Lakes Brass Ensemble had their first performance as guests at my sisters junior band concert. It went really well and I really enjoyed playing. This week’s Sunday Poem is another one of the winners of the Poetry Business Pamphlet Competition. I’ve used one of James Caruth’s poems before as the Sunday Poem a while ago, but I asked him for this poem because it made me laugh out loud. Jim’s poetry is beautiful, lyrical and poised. His poems are not loud or show offy – they are usually quietly understated so this poem with it’s exaggerations and swagger seemed to show another weapon in Jim’s armour. This poem also wears its technical achievement lightly – the line breaks are perfectly measured – look at the break at the end of stanza 2 for example after ‘learn’ so we are left hanging, wondering ‘learn what?’ until we reach stanza 3. And the lovely stanza break at the end of stanza 5. All of the line breaks in the poem work to reinforce the humour in the poem, as does the repetition of the outrageous claim about the spider’s size. at a spider in the bath. A spider as big as my hand. She tells me it’s nothing. Nothing! – It’s as big as my hand. for what it is and nothing more. so much about this spider as big as my hand. will turn and eat every last bit of him. Evening folks. I have exactly 32 minutes to get this blog finished and posted before it becomes officially not Sunday anymore. Today the husband and I got up at 4.30am and drove over to Yorkshire to watch the Tour De France. We parked up and walked 5 miles across the hills to get to Cragg Vale and meet this week’s Sunday Poet, Keith Hutson and his friends and family. For some reason, in my infinite wisdom last night, I’d decided I would fill the rucksack I would be carrying with books, just in case I got bored, as well as the obligatory waterproof trousers in case it rained, a jumper in case it was cold etc etc. After about the 3rd mile, I really regretted dragging along Sharon Olds, Hubert Moore et al and beginning to wish I’d bought a smaller bag with just clothes in. I promised myself I would no longer live in fear of being bored and overpack books that I’d never get a chance to read. I promised all these things! Anyway, we managed to meet up with Keith – the husband had brought the cooker so he could make hot sandwiches ( he knows I don’t like cold ones) – and had carried huge amounts of water to keep us supplied in tea all day. We had a brilliant time – people were chasing random cyclists up the hill, shouting and cheering them up the hill. Everyone seemed in such a good mood – and the weather was really good – sunny but not too much. When the cyclists go past it is all over very quickly – but it was definitely worth going to soak up the atmosphere. So, I did have Keith Hutson down for a poem in a couple of weeks time, but as I’ve just been to the Tour de France and Keith has a brilliant poem in ‘Butcher’s Dog’ which is about cycling, I thought it would suit the day perfectly. Keith has since been published by Pennine Platform, Ian Parks’ journal Hinterland (where he is now an editor), Prole Magazine, Butcher’s Dog and Meniscus. As well as writing poetry, Keith is a Running Poet and coaches boxing as well! I’m going to sign off now because I’m falling asleep whilst writing this blog – thanks again for reading.. I chose this poem because I don’t normally like poems about sporting themes but I really enjoyed this one. I also like how the poem seems to contain a whole narrative about the ‘he’ of the poem. I think this poem really creates pictures in your mind – I can see the spokes giving out silver showers of rain onto the pavement. The appearance of auntie’s knitted racing jumper means I can picture the ‘he’ of the poem. The other thing I really liked about this poem was the beautiful ending – the recollection of the day ‘In spite of God knows what/it still remains.’ I should also come clean and say Keith sent me some cracking poems to choose from – he has another great sport poem called ‘Running with the Africans’ which I was very tempted to put up – but I thought that it was good to have a cycling poem on the day when I’ve spent all day watching lycra clad cyclists sometimes zooming, sometimes trundling up and down the hill. I’m going to stop here because I’m nodding off, whilst typing – I just hope I haven’t made any mistakes when typing up Keith’s poem…..
to be turned and tossed again. at school, the God knows what. uncouple and get left behind.